For some reason the script is reacting poorly with EMCE's post and is screwing up the order of the posts on page 38 of this thread. There's like posts from 9/17-9/27 at the top, then posts from today, then posts from 9/10 through the 17th ending with the post from EMCE at the bottom. Also the Send PM and View Photos links are missing on that page. It's probably not worth fixing if it's just something that 1-2 rogue posts are gonna mess up, I'm mainly only posting here to document the oddity. Interesting! I'll investigate that when I get home. If it's major, I'll revise the script. Either way, I'll post what I find here. so i like looking at new photo additions. sometimes there's a story attached to the photo, for instance moron has this photo_photo.aspx?user=11227&photo=518032&filter=all. i have no idea what that is, but i'm curious enough to find out. i'd love to have a link to his/her posts right there on that page rather than having to search around. it doesn't even need to be as complicated as a list of instances where that pic was posted (though that'd be neat too), i just want a quick user link. Okay, I clearly didn't follow through on El Nachó's issue. Maybe I'll revisit it! Probably not. I think having a mini-profile of the user on the photo page could be useful, sure. Complete with a link to search for that user's posts. I'll put it on the agenda. Are you still planning on (optionally?) changing the way nsfw threads are displayed? At first I didn't just love it, but now that I've gotten used to it, I don't really notice that much, but I would still probably prefer a tag off to the side or something. "Are you still planning on (optionally?) changing the way nsfw threads are displayed? At first I didn't just love it, but now that I've gotten used to it, I don't really notice that much, but I would still probably prefer a tag off to the side or something." Yeah, I'm going to just put a little [nsfw] tag in the column where the OLD and NEW images currently reside in the message boards' lists of threads. I would like a way to add a topic to "my topics" without actually having to click on the topic first! There are several threads a day that I would like to read, but dont want to read it at work, etc. Would be nice to add it to my topics to read later on. "maybe it's just me, but when I'm looking at the message boards page /message.aspx with the script enabled, The Lounge link disappears after being visible for a split second"
I made a thread about. I had an inkling that it may have been due to the better wolf web script. I'm using Firefox. I suppose I should have consulted this thread before making a new thread. Its part of the gunzzDegayifier, which kills iframes. Edit the script and comment out line 279 - iframes (and youtube) will work again. 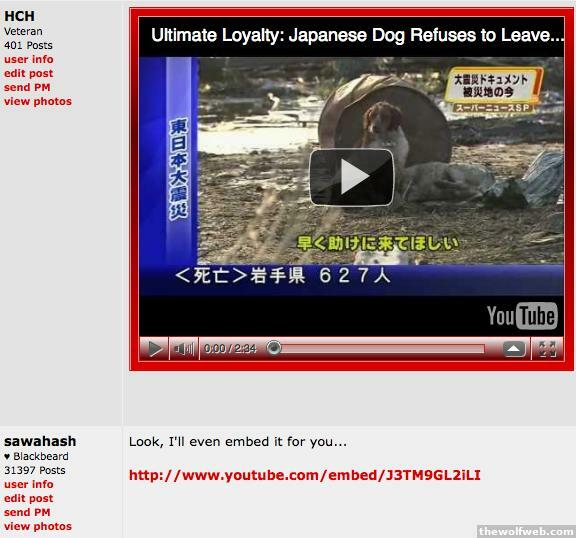 Youtube changed the way the embedded videos work now, and switched to an iframe format. Something broke the search button...now it won't bring up the mini search, and you can't get to the search page at all. ^^wasn't trying to get on you for not fixing it. Just thought it was moderately amusing. Some guy didn't embed and the script helped and then someone does embed and the script undoes it. please god qntmfred, let there be a new TWW layout! please god qntmfred, let there be a new TWW layout!" ^ you press 'v' in a thread, bro. so how to i make this red go away? that should have been "so how do i..."
You can edit the script to make it any color you want. You don't need this script for that. You can just set up a user style sheet that redefines the bar, button, and inbar classes. That's where most of the red shows up. Will this work for chrome? Give it a shot, I guess! how difficult is it to extend the "block user" functionality to include chatterbox posts? Probably not that difficult. Grab the chatterbox form, select each of its child B elements and all of their text nodes, parse the usernames out of the collection, check the names against the list of block users, then either remove those elements or replace them with some kind of indicator that a blocked user posted. That very well could be. The voting function works by sending your ID and information about the post you're flagging to a script on some Web space of mine that validates and records it to a little database. It could be that the XHR got blocked, or maybe your host doesn't recognize my Web space, or who knows what. That sounds likely. While NoScript allows thewolfweb.com, other hidden scripts (I guess inside the GreaseMonkey...script) could still be blocked. I'll turn off noscript, mark a thread, and see if that makes me show up on the list. "Grab the chatterbox form, select each of its child B elements and all of their text nodes, parse the usernames out of the collection, check the names against the list of block users, then either remove those elements or replace them with some kind of indicator that a blocked user posted." Whatever I decide, I'll just stick it in a function call blockPostInChatterbox. Since I can see the chatterbox on every page when I'm logged in, I'll want to block it regardless of the URL, so I'll throw a call to a function to be defined later called blockInChatterbox in the checkLogin function, but only if I'm logged in. No sense in doing all that work if I'm not logged in, right? 3. Parse out all usernames in the chatterbox. 5. Run each chatterbox post by a blocked user through my blockPostInChatterbox function. Not too bad! I guess I could test that out, maybe include it in a future release. I have discovered that the NSFW button only works if you type "v", click the [nsfw] link, and then type "v" again. you have to close the dialogue for it to complete. for me anyway.